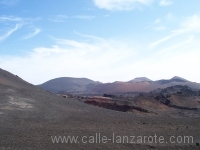 El Golfo is situated at the south-west end of the island. Itself a small fishing village, it has one big attraction – the volcano crater with the green lagoon. The crater in itself is fascinating enough – parking at the shop and restaurant just outside the village, you walk along a narrow path with a handrail on one side and the rock face on the other until you reach a natural viewing platform. 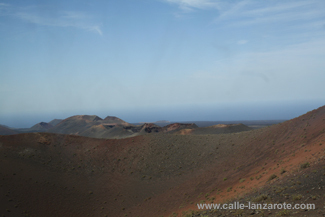 At this point you are in the crater – only half of it is missing, wash away by the Atlantic ocean. Looking landwards the remaining side of the volcano towers above you, black and red layers of dried lava and other rocks make for a stunning view. It is not hard to imagine the power that this volcano once had. 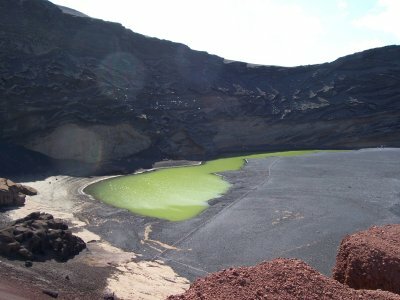 But that is not all – down below is the green lagoon, a naturally formed pool of water that shines bright green. 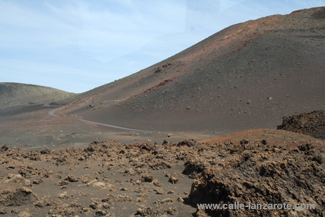 The effect is caused by minerals left over from the volcano’s active days. The water flows in from the ocean by an underground channel and mixes with these minerals to give it it’s green colour. On the way back to the car park you can pick up a piece of green rock for a reasonable price from one of the collectors’ tables – often unmanned with just a collecting tin to put your money in. For more elaborate souvenirs there is the shop at the car park, as well as Teguise market.